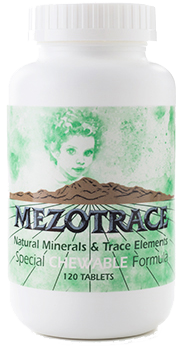 Mezotrace Natural minerals & trace elements. Whole. Untouched. Complete. 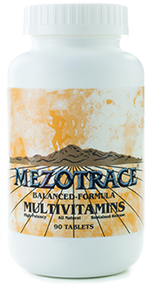 Tablets especially formulated to provide correct vitamin supplementation for users of Mezotrace® Calcium/Magnesium Natural Minerals & Trace Elements. Contains a natural bioflavonoid complex, vitamin D, and more. Ingredients: Vegetable Stearates, Cellulose, Magnesium Stearate, Silicon Dioxide, Carnauba Wax, and Magnesium Trisilicate * = No nutritional values claimed. Due to the minerals in this product being mined and new FDA laws, the supplemental facts box may change from lot to lot. Signs and symptoms of magnesium deficiency are frequently encountered in clinical practice, especially among patients with functional or stress-related disorders. A perfect blend for both children and adults who have difficulty swallowing tablets. The most complete source of calcium, magnesium and trace minerals available in a supplement. Call 800-843-9989 or contact us by email. © 2019 Mezotrace. All Rights Reserved.